Designed for use on Nikon's FX-format D-SLR cameras, this updated medium telephoto f/1.8 lens is great for shooting stills or HD videos. 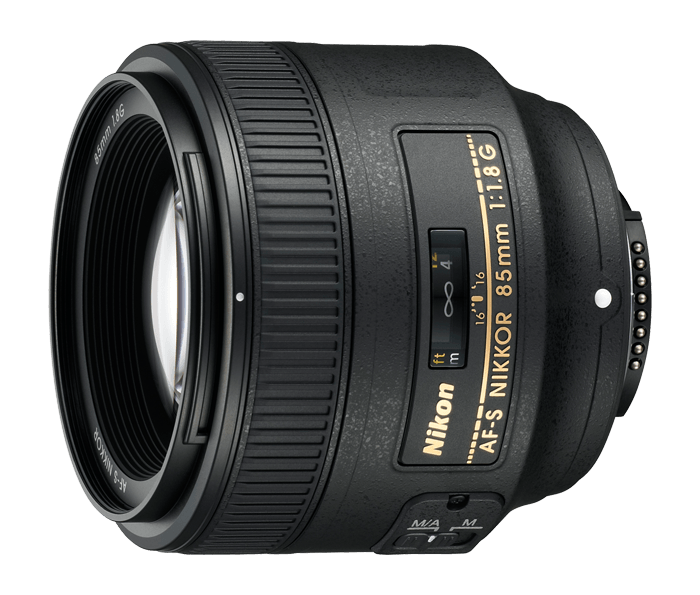 The AF-S NIKKOR 85mm f/1.8G features Nikon's Internal Focus (IF) system providing fast and quiet AF and produces sharp and clear images at all apertures. Its fast maximum aperture is ideal for taking stills or HD videos under ideal lighting, in low light, head and shoulder portraiture, weddings or concerts. When mounted on a DX-format D-SLR, the AF-S NIKKOR 85mm f/1.8G has an effective field of view of 127mm. This medium telephoto portrait lens is great for use in the studio, on set or for shooting in available light; producing stills or HD video of people with attractive skin tones and beautiful background blur. With its fast f/1.8 aperture, the AF-S NIKKOR 85mm f/1.8G will capture even low-light situations with stunning brilliance. When you need to isolate the subject from the background, as when shooting portraits—indoors or outdoors—stills or HD video, the AF-S NIKKOR 85mm f/1.8G renders a beautiful, natural background blur (Bokeh) at its wider aperture settings. Nikon's Super Integrated Coating (SIC) enhances light transmission efficiency and offers superior color consistency and reduced flare. Nikon's Silent Wave Motor (SWM) assures fast, accurate and quiet autofocus as well as full compatibility including autofocus with Nikon's complete line up of FX- and DX-format cameras. **As determined by Nikon performance tests.